"Bohemian Rhapsody," a biographical film about the legendary British rock band Queen, is captivating the hearts of young and old alike in Japan, where in the 1970s the band saw success before anywhere else. The film, released in Japan on Nov. 9, grossed more than 2.6 billion yen ($23 million) at the box office, with 1.8 million people watching the film within the first 20 days of its release. Matching the film's surging popularity, the soundtrack reached the top of Japan's weekly digital album chart on Dec. 3, with Queen Jewels, a greatest hits album first released on CD in Japan in 2004, ranking second, making Queen the first non-Japanese artist to ever occupy the top two spots on the chart. Japanese fans have flocked to sing-along screenings, where the audience is encouraged to sing karaoke-style and to turn up dressed as band members. The number of theaters offering the special screenings quickly expanded to more than 100 across the country from just two on opening day. 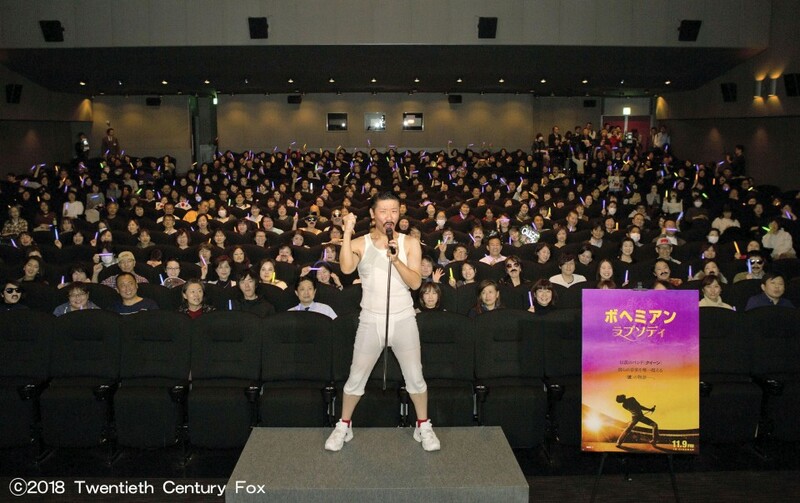 Tickets sold out in just 10 minutes for a special Bohemian Rhapsody screening on the night of Nov. 30 in Osaka, where Japanese rakugo storyteller Katsura Sando dressed up as Queen's flamboyant vocalist Freddie Mercury. Some 480 fellow fans joined Sando in donning some of the iconic outfits associated with Mercury -- yellow jackets, red capes and king's crowns, black leather jackets and fake mustaches, among others. When the emcee of the event asked the crowd whether they were seeing the film for the first time, it turned out approximately 70 percent had already seen it at least once. One particular die-hard was seeing it for a sixth time. While the film has proved a blockbuster in many countries, some music journalists and film critics say that the band's connection to Japan, referenced a number of times in the film, gives locals a particular affinity to Bohemian Rhapsody. In April 1975, when Queen arrived at Tokyo's Haneda airport on their first tour of Japan, the band, made up of Mercury, Brian May, Roger Taylor and John Deacon, were still a budding act in their home country. So, they were very surprised to be met by more than 3,000 young women waiting for them at the airport, according to the website of Universal Music Japan, which sells the soundtrack. Kaoruko Togo, former editor-in-chief of Music Life magazine, is credited with sparking the first Queen boom in Japan in the 1970s. Togo said in an interview with the Daily Shincho that she heard Queen lead guitarist May saying that the sight at the airport made him feel as if he had come to a "different planet." Mercury, who died at 45 in 1991 from health complications linked to AIDS, was known as a fan of Japanese art. He had a Japanese garden in his London house and would wear kimono while relaxing at home, a habit depicted in the film. "I think the film's success is owing to its simple structure, culminating in the last part in which the band's Live Aid performance is reproduced. The way it was dramatized allows audiences to feel as if they are experiencing what is happening in the film," said Masaki Uchida, a writer well versed in music and films. "The film cut details and depicted a drama that mixed the stories of Freddie's personal growth with the band's success. It's intriguing because we feel as if we are watching how the band recorded their music and how they fought with each other in front of us," he said. 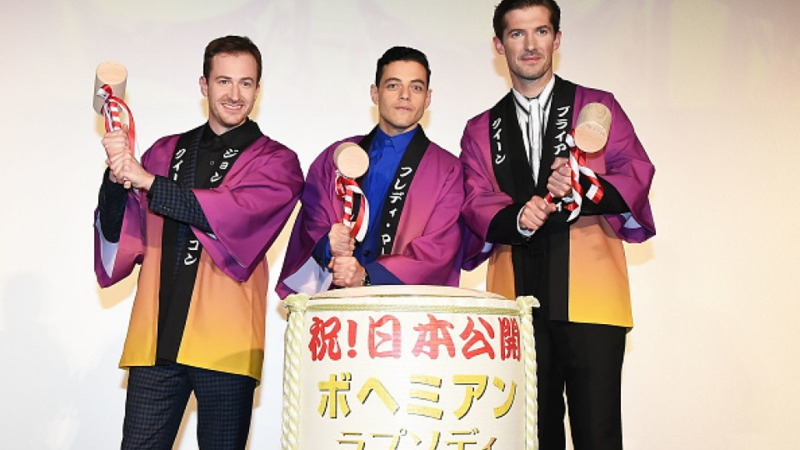 Yui Yamazaki, a 32-year-old Kyodo News reporter and longtime Queen fan, attended the special screening in Osaka wearing a jacket with a penguin motif, an animal May is known to adore. Although the reporter was only 5 when Mercury died, she and her 28-year-old sister became Queen fans because their parents loved the band. Yamazaki even went to London in 2005 to see a Queen concert featuring Paul Rodgers in Mercury's place. She said the concert was great, but she missed terribly the dynamic lead singer's incredible voice. "To fans from younger generations who can only enjoy Queen in videos and recordings, the sing-along screening made our wish of interacting with the band come true," said Yamazaki, who cried when joining in with Mercury's trademark "ay-yoh" call and response in front of the giant Live Aid crowd. Bohemian Rhapsody portrays the loneliness Mercury felt despite his and the band's massive commercial success and how he had a life-long search for acceptance. Music critic Takashi Kitazawa said, in addition to Queen's timeless hits, growing awareness in Japanese society toward issues related to homosexuality may have played a part in boosting the film's popularity, as Bohemian Rhapsody, the film's title song written by Mercury, is thought to explore the struggle he had with his sexuality.